What a great write up, it is amazing when you list the things that you have made to see just much you’ve made and how different each thing is, well done you! What a clever and effective idea, to make placemats. Now you just have to remember where you store them for Christmas! She was meant to have that quilt, lucky her, it is lovely. I do love a happy ending! Thanks Lyn, I love getting a goodie pack in the mail and then deciding what to do with it! I was lucky enough to be sent the Makower UK Festive Range of fabric squares to review recently, can you imagine, Christmas fabric in April, what fun!!! Lol Helen, your comment did make me laugh and you are totally right about nasty cheap fabric and dodgy colours! Thanks Corinne, it is reassuring to know that I am doing the right thing. 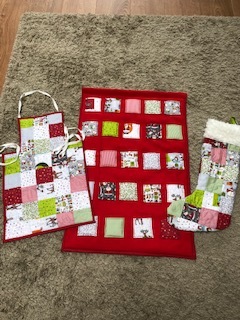 Thanks for your comment Teresa, I like to make what I want to make too and most of the time that is what I do, but I now have a stash of about 12 fully made up quilts and 7 tops, they have to get sold as I can’t store them all and everyone has a quilt and I don’t want to stop making them. Oh the dilemma’s…. I really enjoyed reading your article and found it informative. Being relatively new to sewing / quilting (just 2 years) I haven’t tried any hand quilting anything yet. However I look forward to reading all your other parts and then maybe I might bite the bullet (needle!) and give it a go. Thanks Sylvia, it’s good to know that you agree with me, families can be so tricky and easily offended sometimes. Thanks Ann, bring on the sun!! I agree with your ethic – if you are gifting then that’s fine, but they are gifting at your expense then that’s altogether different. In the least they should pay for the materials and a contribution to your time, or if not the time make a gesture! I’m with you all the way. If you’re asked to make a quilt by someone then you charge. Family member/friend or customer you charge. I agree Ami, I have made double quilts & baby mats for family, including my parents, step daughters and grand-children. I have also made for my personal friends having children or new grandchildren as a totally surprise gift. As a purely surprise gift I was then under no pressure, as there was no expectation & if I chose to spend my money & my fabric & time that was my choice. 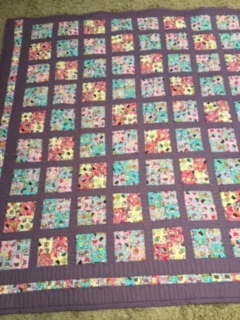 I have on a few occasions made quilts for other incoming babies of friends of friends on request, and a sensible discussion about actual costs & timescales has always happened first. They have always been delighted, and often paid far more than actually requested, more often as a personal gift of lunch out, plants for the garden, or a nice bottle of wine in appreciation. I am now making quilts for the Quilts for Care Leavers project, again totally my choice if I want donate my materials and time. I think you have done well to stand firm on this, and let family and friends know why. I wonder if they even realised that what they were doing was the same as asking you to buy a present (the value of your labour) to give to someone you didn’t know. I personally don’t sell quilts, or even take money for materials, but then I have decided I will not make to someone else’s requirements. I make what I want to make, from fabric that has come from my “hobby budget”, and as I end up with surplus quilts there will be some unexpected lucky recipients or charities. This happens to my students a lot – they make something for themselves, then get an approach along the lines of “you enjoy this, why not make something for my second cousin’s third wife’s stepson” with no offer of payment. They usually have the common-sense to say no, or at least to ask my advice, at which point they get given a standard “costs” document. Mostly, at this point the requester gets the idea that this is not a favour one should ask quite so freely..